One trend that I have been LOVING is the sneaker trend, and this season it's hotter than ever! Sneakers are no longer just for working out or "bumming it" on the weekends. 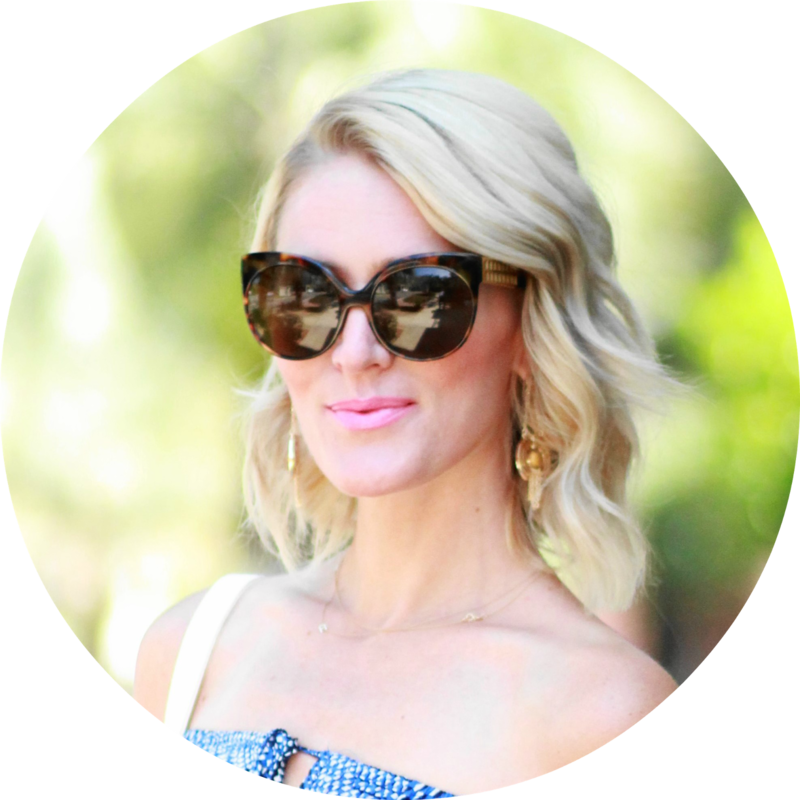 They've become just as stylish as those pointed-toe pumps in your closet, and are just as versatile too! We're seeing sneakers in all colors and styles and they're being paired with everything from structured suit sets, to flowing maxi dresses. You really cannot go wrong with your styling -- anything goes! I've been collecting unique pairs of sneakers for awhile now (especially since I became a mom back in 2012). They're just so easy to throw on and be out the door. One of my fave sneaker brands is Adidas. They're so classic and comfortable, and I love all the great colors that they come in. This navy color is my newest fave and it is so perfect for fall. These beauties are from DSW, which happens to be one of my favorite places to buy shoes -- online or in-store. DSW has been a leading footwear and accessories retailer since 1991, and they always offer a wide selection of name brand and designer footwear and accessories for women, men and kids. Plus their styles are super affordable, which means I'm usually scooping up more than one pair. ;) DSW also carries exclusive styles from some of our most coveted brands, like Marc Fisher, Lucky Brand, and Adidas. I love these Adidas so much, I just had to show y'all two ways of styling them, so my first post is styling them for day. Obviously day-time wear is a no brainer when it comes to sneakers, but I wanted to style a look that was casual and comfy, but still polished. Plus, fall is here and who doesn't love cozy knits? One of my go-to fall looks that I love to rock with sneakers involves items that just about everyone has in their closet: a basic tee, a cozy knit, and your favorite denim. For this look, I suggest sticking to a similar color palette when pairing your knit and denim (like I did with dark gray and black), as it tends to elevate your look. I went with a duster-style cardigan because those tend to offer up a dressier vibe, especially when they have nice collars like this one. I finished my look with a structured bag, some gold accessories for extra polish, and some oversized black sunnies for extra chic vibes. This look is the epitome of effortless chic and can take you from errands, to brunch with friends. Depending on your office/work environment, you could even swap the denim for a pencil skirt and still rock the tee, cardigan, and sneakers. For extra chilly temps, try ditching the tee and opt for a chunky cable knit sweater for extra warmth. I especially love over-sized styles, including turtlenecks! What do you y'all think of my sneaker look for the daytime? Would you wear it? What's your fave way to style your sneakers? Stay tuned for a second post tomorrow where I'll be showing you how to rock your sneakers for night. Fantastic casual and minimalistic outfit, I like your sneakers and cardigan very much! LOVE this whole outfit girl!! LOVE the blue suede sneaks! Seriously so practical and cute! LOVE the casual yet pulled together look created here . 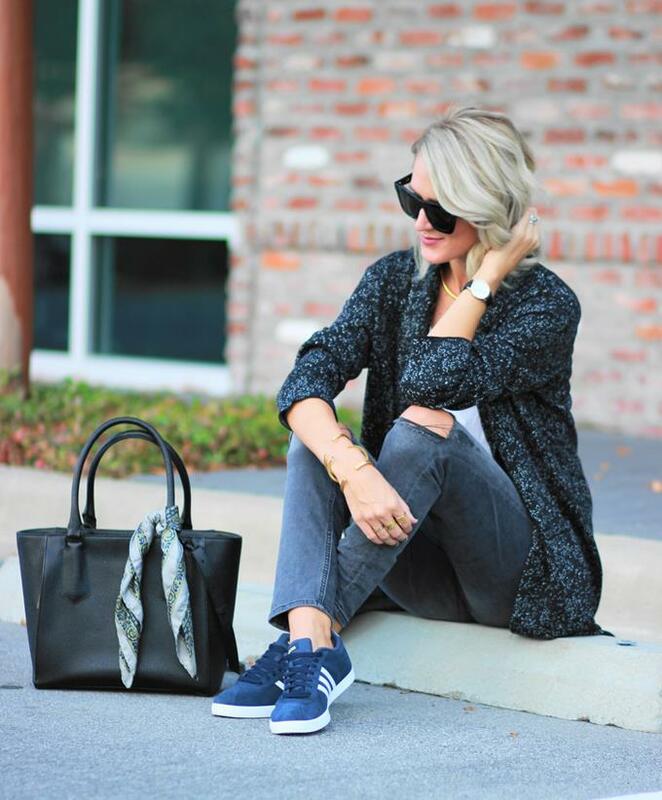 The blue sneakers are adorable and really cute matched up with the denim and long sweater. I love the outfit, how she looks cute and casual at the same time. The blue is snekears are lovely and makes her look confixrnce. I love the snekears, looks precious. I really like it. I luv that look for those casual days, looks comfortable but you still have style.